Buddy the Shih Tzu was just playing around at home with his two doggie siblings when something scary happened - his eyeball suddenly popped out. 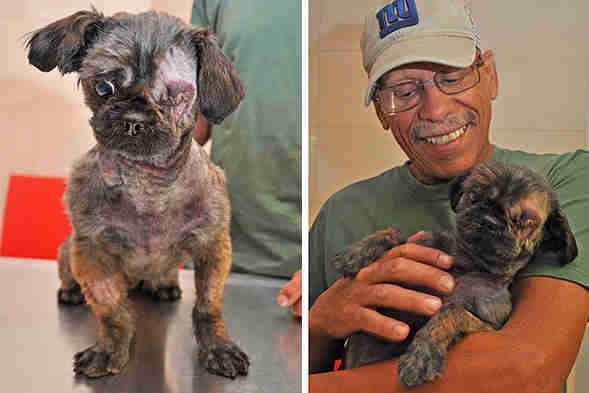 As his eye hung dangling from its socket, Buddy's shocked owner, Oscar, rushed him to a clinic. They sent Buddy to the ASPCA Animal Hospital, where he met Dr. Maren Krafchik, a veterinary ophthalmologist. What happened to Buddy's eye is called proptosis, and it's not as unusual as it may seem, Krafchik explained to The Dodo. It happens when pressure on the eyelid causes the globe (or eyeball) to "pop" out of the socket. In many instances, "it looks a lot worse [than it is]" Krafchik said, noting that the eye can often be saved if the owner acts quickly enough. 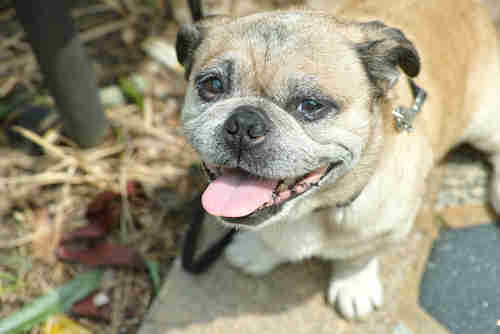 Proptosis is most common among brachycephalic breeds, or short-snouted breeds with shallow eye-sockets, like pugs, French bulldogs and Boston terriers. "They tend to have these big bulging eyes," Krafchik said. It can happen to any dog, and often occurs after trauma, but for brachycephalic dogs like Buddy, proptosis can happen during normal play or horsing around. Their eyes can pop out without much force. 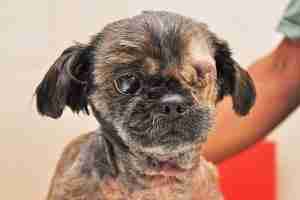 One vet described a dog who bumped into the edge of his kennel and popped out his eye. "It happens completely all of a sudden," Krafchik said. But there's no need to live in fear - oftentimes, if owners take action quickly, the eye can be reattached. In one study of dogs with proptosis, 27 percent of the affected dogs had their eye reinserted and their vision restored. 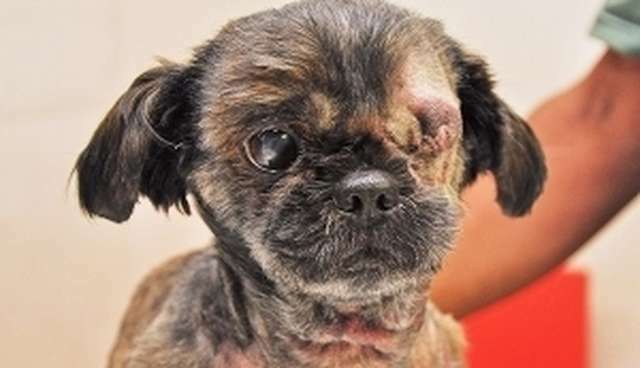 Even if the eye can't be saved, dogs still have a chance at a very happy life. "I see tons of dogs with only one eye," Dr. Chaim Litwin, a veterinarian in Woodbridge, Connecticut, told The Dodo. "They generally do quite well." In Buddy's case, his eye couldn't be repaired and Krafchick had to remove it. But, just as Krafchik said, he recovered well - so well, in fact, that she hasn't had to see him again. "Animals are very resilient," Krafchik said. "They seem to rebound right after the surgery - the prognosis is great."